The stainless steel welding process varies depending on the thickness and finish of the material, as well as the use of the finished product. While there are a variety of methods for welding stainless steel, there are three that are used most commonly by welders in the United States. These stainless steel welding methods are TIG welding, resistance welding and MIG welding. 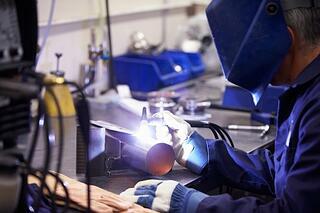 They are TIG welding, resistance welding, and MIG welding. Keep reading to learn more about each. Offering high quality, versatility and longevity, TIG is the most commonly used stainless steel welding process. This welding process creates a low heat input, which makes it perfect for thin material. The argon gas is often mixed with other gases, depending on the needs of the specific project, including helium, hydrogen and nitrogen. To prevent oxidation and increase resistance to corrosion, a single-sided welding process can be used creating inert backing gas protection between the interior and exterior welds. Resistance or “spot” welding, as it is often called, is one of the most economical types of welding. The resistance welding (RW) equipment is incredibly versatile, which means it can be used on both small and large projects. RW uses an electrical current to heat frayed metal edges and seal them together. This type of welding is exceptionally productive on metal with a low melting point because it can be tailored to prevent distortion of the metal. MIG welding is a semi-automatic process that when done correctly offers a strong joining of two pieces of stainless steel. This process uses an argon rich shielding gas and a solid wire electrode. MIG welding is popular because it allows the welder to utilize a pulsed current supply, which can make it easier to weld those tough-to-reach spots on complex stainless steel projects. Other gases mixtures, including those with helium, oxygen and carbon dioxide, are often used to stabilize the arc and improve the quality of the weld. Which Stainless Steel Welding Method is Best? Choosing the right method for welding stainless steel really depends on what qualities you’re looking for. If you're looking for a more affordable weld, spot welding might be the best option for the job. But if the material we’re working with is thin, then TIG or gas tungsten arc welding might be the better choice. At All-Type Welding and Fabrication, Inc., our team of welding experts will evaluate the materials, capabilities and finishing style you want for each project to determine which welding method will be most effective for the task. With extensive welding knowledge and years of experience on the job, ATWF is up to the task of choosing and implementing the best stainless steel welding method for you. Contact us today to get a quote, learn more about our process and get all of the answers you’re looking for.